The Barbizon Hotel at East 63rd Street was landmarked on April 17 by the Landmarks Preservation Commission. MANHATTAN — The former Barbizon Hotel for Women is the Upper East Side's newest landmark. The 23-story tower at 140 E. 63rd St., built in 1928 as a residence for single women looking to work in the Big Apple, was awarded historic status by the Landmark Preservation Commission on Tuesday. The Barbizon was a glamorous home for aspiring models and actresses like Grace Kelly, Liza Minnelli, Ali MacGraw and Candace Bergen before they were stars. In the 1930s, its residents included actress Gene Tierney, writer Eudora Welty and Margaret Tobin Brown, a survivor of the Titanic whose story inspired the Broadway musical, "The Unsinkable Molly Brown." Musical comedy legend Elaine Stritch and future first lady Nancy Davis Reagan stayed there in the 1940s, when the Ford Modeling Agency began housing its models in the hotel. Writers Joan Didion and Gael Greene and the designer Betsey Johnson stayed there in the 1960s and 1970s when they were college interns for Mademoiselle magazine. The hotel was seen as a safe haven for women starting out in New York. It enforced strict dress and conduct rules such as forbidding men from the lobby without strict supervision. "The hotel over time has been celebrated as much for its artful brickwork, masterful setbacks and eclectic ornament as the artists, writers and actors who lived there," Commission Chairman Robert Tierney said in a statement. The Barbizon was immortalized in fiction as the Amazon in the "Bell Jar," by Sylvia Plath, another of the hotel's famous guests. "The architecture is significant of eclectic Renaissance and Gothic revival style apartment building," Tara Kelly, executive director of the Friends of the Upper East Side Historic Districts had told DNAinfo. "But more important than the architecture significance is how many women came through. It was a place to protect their reputation as they were alone and single." 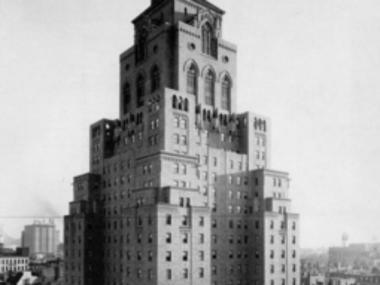 The Barbizon was one of many residential hotel buildings in the first half of the 20th century that were seen as alternatives to rooming houses or transient hotels. It was considered classier than the YWCA but less exclusive than a private club. It had single rooms, dining rooms and a cleaning service, according to the LPC. But by the mid-1970s, the hotel began to lose its sheen. Men began staying there in 1981. Then KLM Airlines bought the building in 1983 only to sell it five years later. The Barbizon was converted into condominiums in 2006.